The dramatic, architecturally lit penthouse offers event space with dramatic views of Los Angeles. This space is flexible for private events or corporate conferences complete with a state-of-the-art 20-foot screen for presentations, seminars or film festivals. Whether you're planning a gala, cocktail reception, wedding or corporate event, the Penthouse is the place to be. The rate for The City View Penthouse (north facing side), which includes access to the City View Deck, is $7,500 and has a maximum capacity of 180 seated or 220 standing. 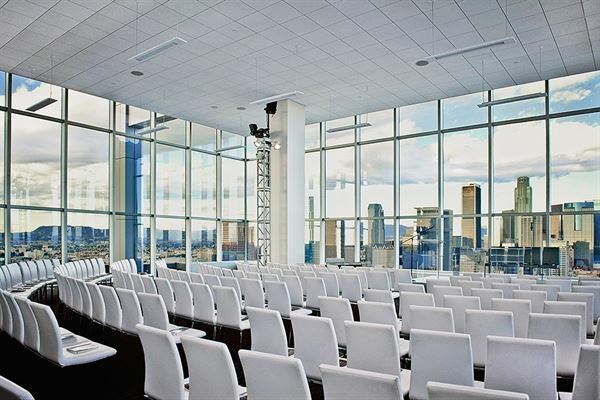 The full 30th floor and deck is $11,500, maximum capacity of 300 seated or 400 standing. Additional information is attached. What’s included: • Air conditioning • 100 Self-parked parking spaces (valet available at an additional cost) • Furniture on hand • Security personnel • Janitorial crew • Building engineer on call • Built in A/V system with 20x20 screen and projector on North Side • The venue space is until 12:00am. Any additional hours past 12:00am is $750/hr. The City of LA requires a Fire Permit from the city which costs approximately $500. Once the details are finalized, I typically put clients in touch with the Fire Marshall. We do work exclusively with (and highly recommend!) Patina Catering. Outside caterers are welcome, however there is a $1,500 outside catering fee.